Even Scientific American has gotten into the act. An article by Harvard oncologist Marc B Garnick says, “Evidence shows that screening [for prostate cancer] does more harm than good.” Go here for an interview with Dr Garnick. Why this great awakening about the unsatisfactory effects of PSA screening? It’s the result of reality seepage and the consequence of confusing intention with outcome a common condition among those who want to improve our lot. 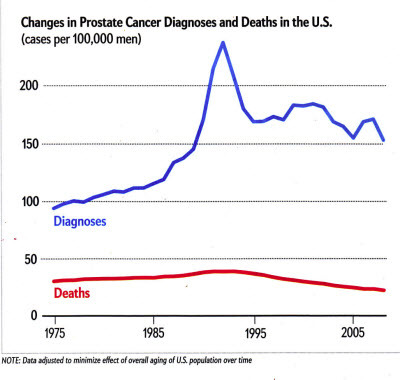 When the PSA test first became available the approach that science should have mandated was a study of whether early diagnosis of prostate cancer using this test improved morbidity and mortality secondary to the disease. Roger Bacon could have figured that out; but we (the medical profession) decided to skip that step and advise universal application of the test. The incidence of the disease of course went up, but not much happened to mortality from it. Treatment always has unwanted effects which may be tolerable if the benefit is large enough. But when the benefit is minuscule or non-existent we have a disaster. I’ve presented all the data relevant to this issue previously and you can read the posts without my restating them. The lesson, however, is so important and so hard to learn that it needs constant repetition – evidence first remedy second. When I and others pointed out more than 25 years ago that the value of this test was unproven we were called a variety of unfriendly names among which was nihilist. I’ve lost track of how many panels devoted to prostate cancer I participated in. My putative role was the token nay-sayer whose real role was to be a piñata during the Q&A. Since I was dealing with urologists, for the most part, the odds were actually in my favor. Me: Is Head Start a good program? Student: Because it helps children. Me: Go to the Library (when I first started doing this we still went to the Library) and look it up and then tell me what you found. Me (after the student went to the Library or Google): What did you find? Me: Why are we still doing it? It’s a simple fact which seems almost impossible to grasp that much, if not most, of the world’s ills result from poorly thought out good intentions. If Dr Garnick (who seems to have just realized the the scientific basis for PSA screening was incomplete) and the rest of the medical enthusiasts who unleashed the test on the aging male population had followed the analytic methods they were taught both in college and medical school this whole saga would have been avoided.